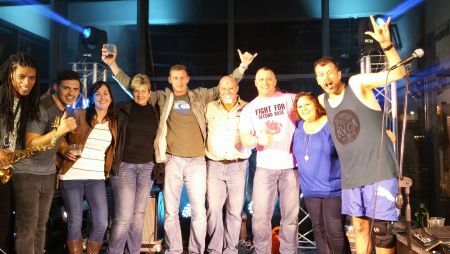 Earlier this month our dealership had the privilege of hosting Jack Parow & Loki Rothman for a night to remember in aid of breast cancer awareness. The evening started off with an incredible performance by Loki & fellow musician Hiram Koopman, followed by Jack Parow in all his out-of-the-box glory! People started arriving from as early as 6pm and by the time the concert began, everyone was excited to see what the evening had in-store for them. Safe to say, Loki's guitar skills blew us out of the water and we couldn't have hoped for a better opening act! (Loki is Jack's guitarist but also a solo artist in his own right). Many in the crowd had never seen Jack Parow live and he did not disappoint! By the end of the evening, every person inside the Durban dealership was either dancing, singing along or tapping their feet. Thank you so much to every person that came through to show support not only for the artists, but also for the great cause of raising awareness & funds for breast cancer! For the 5 finalists that were put into the draw for the Street 750™ - Harley® will do the draw for the last 5 at Zambezi on the 24th Sep and then have the final draw done in Cape Town on the 12th October '15. Our next event to diarise is the Pink Glove Run on 31st October '15 where we will be doing a mass ride to show support for CANSA also in aid of breast cancer awareness.